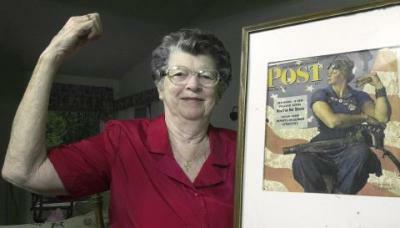 FILE – In this May 22, 2002 file photo, Mary Doyle Keefe poses at her home in Nashua, N.H., with the May 29, 1943, cover of the Saturday Evening Post for which she had modeled as “Rosie the Riveter” in a Norman Rockwell painting. Keefe died Tuesday, April 21, 2015, in Simsbury, Conn., after a brief illness. She was 92. (AP Photo/Jim Cole, File) (Jim Cole/AP)Mary Doyle Keefe, the model for Norman Rockwell’s iconic 1943 Rosie the Riveter painting that symbolized the millions of American women who went to work on the home front during World War II, has died. She was 92.Keefe died Tuesday in Simsbury, Connecticut, after a brief illness, said her daughter, Mary Ellen Keefe. Keefe grew up in Arlington, Vermont, where she met Rockwell — who lived in West Arlington — and posed for his painting when she was a 19-year-old telephone operator. The painting was on the cover of the Saturday Evening Post on May 29, 1943. 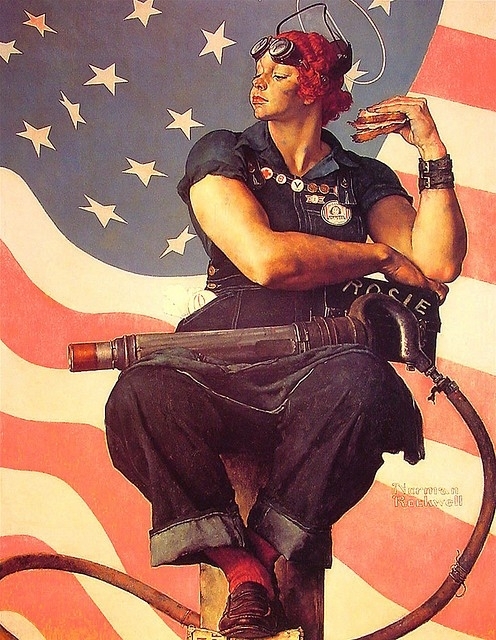 Although Keefe was petite, Rockwell’s Rosie the Riveter had large arms, hands and shoulders. The painting shows the red-haired Rosie in blue jean work overalls sitting down, with a sandwich in her left hand, her right arm atop a lunchbox with the name “Rosie” on it, a rivet gun on her lap and her feet resting on a copy of Adolf Hitler’s manifesto “Mein Kampf.” The entire background is a waving American flag.